Cooper Zeon LTZ and Nitto Terra Grappler are both classified as all-terrain and all-season tires. They are quite popular choices on the market for trucks. They are relatively affordable if compared to the competition. You can say that these two tires are in a similar price range. Cooper Zeon LTZ is praised as an excellent hybrid of a sports truck tire and an all-terrain tire, providing superb ride and handling capabilities. On the other hand, Nitto Terra Grappler is famous for the prowess on harsh and challenging off-road terrains. So, which is the one you should go with? Even though both of these two tires are said as all-terrain tires, neither is actually perfectly suitable for extreme terrains. They are, however, able to perform for mild off-road, and they are most suitable for on-road use. Cooper Zeon LTZ has great aggressiveness that can tame any road surface regardless of the weather and season, providing a comfortable ride and precise, powerful handling. It has alternately scalloped shoulder lugs, lug tie-in zones with raised and serrated lug locks between tread block elements, and long “Two Z” element siping, all providing enhanced traction especially on soft and slippery surfaces like mud and sand. These features also reinforce the tread pattern for solid steering in any environment condition as well as improving the durability. 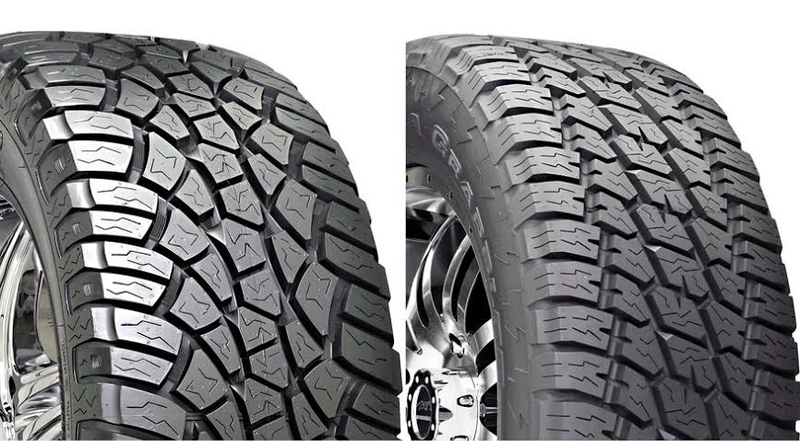 Nitto Terra Grappler comes with circumferential grooves that promote the straight-line traction in wet conditions. The high-density siping helps to resist hydroplaning, and the coupling joints reduce tread flex for stability especially at high speeds. The tire also features staggered shoulder lugs for performance in any terrain, and you can also notice a similar double Z-like pattern on the elements. Read also : Cooper Zeon LTZ vs Cooper AT3. Both tires are best suited for on-road use and mild off-road. However, for on-road use, Cooper Zeon LTZ is the one that truly shines. The tire has exceptional performance. The traction and handling are great, even in rain or snow. It is also a more silent tire. If you hate hearing noises from your tires, then Cooper Zeon LTZ is the one to choose. Meanwhile, Nitto Terra Grappler offers better off-road performance, although it is not the best choice for extreme terrains. Still, the staggered shoulder lugs prove to deliver enhanced traction and handling when going off-road. However, Nitto Terra Grappler is a noisy tire. - All-terrain design to provide dependable all-terrain performance. - Alternately scalloped shoulder lugs for improved traction on soft surfaces like mud and sand. - Long "Two Z" element siping help provide for long. - Circumferential grooves for straight-line traction in wet conditions. - Coupling joints reduce tread flex for high-speed stability. - Staggered shoulder lugs for increased all-terrain performance. In general, Cooper Zeon LTZ is the better way to go. It has excellent performance in any weather and it is also quieter. However, if you need more power for regular off-road use, Nitto Terra Grappler is more suitable.